The very first feature film I’ve seen (as far as I can remember) was the original Walt Disney film “Snow White and the seven dwarfs” when I was about 6 years. It was in such a tiny village cinema in the pre-smartphone era. You could actually enjoy a movie without the feeling that you were in some kind of nightclub with all these luminescent screens. That movie made quite an impact on me. Maybe that’s where my love for the medium of film was created. Later in life, I read lots of books. Especially the fantasy genre appealed to me. A fantasy world as Terry Pratchett, Feist, Terry Goodkind and Tolkien (of course) described it. When reading a book about a mythological and magical world populated by dwarfs, giants, wizards and knights, I spent hours in this imaginary setting. The film industry also amused me with great movies like “Willow“, “The Lord of the Rings” or “The Chronicles of Narnia“. I’m a bit embarrassed to say this but I was thrilled to see the first Harry Potter movie. Sounds as if I’m a teenager. And nowadays, being a father, I enjoy watching “Frozen” and old Walt Disney classics with my two kids. To make it short: I still love a fairy tale once in a while! “Jack the Giant Slayer” and “Snow White and the Huntsman” already appealed to me. The first one because of the beautiful SE’s and the impressive giants. The second film because of the gang of funny dwarfs. Sad enough the expression on the face of Kristen Stewart was again of the same level as a typical pancake. That disappointed me a bit. And that’s the most successful part of “Maleficent“. The wide range of expressions that Angelina Jolie demonstrates herein. No discussion. She was perfect for the role. That soft and sweet look while relaxing and during loving moments. The menacing, unyielding gaze during a confrontation. The devastating evil glance at the time she felt betrayed and hurt. Both facial expressions as body language are used by Jolie in a fantastic way. Those glittering eyes, those sharp cheekbones,the dominance and that demonic laughter. I never thought I would say this about Angelina Jolie, but this was really a beautiful rendition. Everyone knows the story of “Sleeping Beauty“, so it’s a bit pointless to summarize it here. But if you assume that this is an ordinary film that doesn’t deviate from the original story, then you are mistaken. This time they looked at it from a different angle. And I must admit that you can call it a fairly successful result. First of all the build-up to the story of “Sleeping Beauty” was magnificent. Although it looked more like the intro of “Settlers”. It felt cartoonish. That feeling goes away the moment you enter the Moors. A magical land adjacent to the human civilization, where only peace and happiness prevails, and one does not know or understand the human traits of greed and envy. A magical landscape populated by all sorts of wondrous characters, including the small (but powerful) fairy Maleficent who lives in a huge tree. That she eventually becomes the evil and vengeful witch because of underhanded treachery, is a very creative brain twisted idea that the filmmakers have used here. And the denouement differs somewhat from the original fairy tale. But I must admit that I found it extremely fascinating and unique. About the parts being played I can be short and concise. 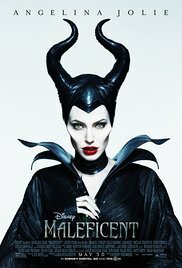 There is only one masterful rendition in “Maleficent” and that’s the one Jolie takes care of. The whole movie revolves around this character and (I can not say it enough) she did it masterfully and professionally. An engaging and friendly character at the beginning, who’s determined to defend the Moors against the humans. And then transforming into a nasty, evil witch with a devilish smile. The most striking imaginative scenes were the battle at the Moors and the christening. Then you see her slowly transform into an understanding person with remorse. For once I felt sorry for the wicked person from a fairy tale and sympathised with her. The other members of the cast were reduces to meaningless roles that were necessary for the story because of this acting by Madame Jolie. Elle Fanning did well as Aurora (Sleeping Beauty) but was really annoying after a while with her innocent giggling all the time. Sharlto Copley was convincing as the power-hungry King Stefan. And the three fairies, who were given the task to guard Aurora until her 16th birthday, didn’t look great when they were still mini. But they took care of the humor side of the story. The only one who could make an impression next to A. Jolie, was Sam Riley as Diaval. But I guess the successful effects when he transformed into a horse or dragon again, had something to do with that. And then there is the second very important part of this film : the special effects. These were at times overwhelmingly great. The landscape of the Moors, the creatures living there, the battle against the humans with the living trees (immediately reminded me of “The Ents” from TLOTR), the dragon and the flying skills of Maleficent herself. Breathtaking and simply beautiful. With a budget of roughly $ 200 million it ought to be. And Stromberg as a director also guarantees that. He knows the craft of visual effects, looking at his impressive resume on IMDb. An entertaining movie with a masterful interpretation. Nothing negative to say then ? Oh yes, it’s sometimes so blandly and predictable. Immediately you feel where it’s going and how the denouement will be. It’s not very original and the surprising twist is actually obvious. But it’s a long time since I was immersed in a fairytale atmosphere like this and momentarily I forgot I had already passed that age where you still believed everything. I believed in it again during 97 wonderful minutes. I’m not normally a Disney fan, but this film held my attention from beginning to end. Jolie is a magnificent Maleficent.